Adult apterae of Macrosiphoniella pulvera are greyish-green, or greyish white, and are heavily wax-powdered. 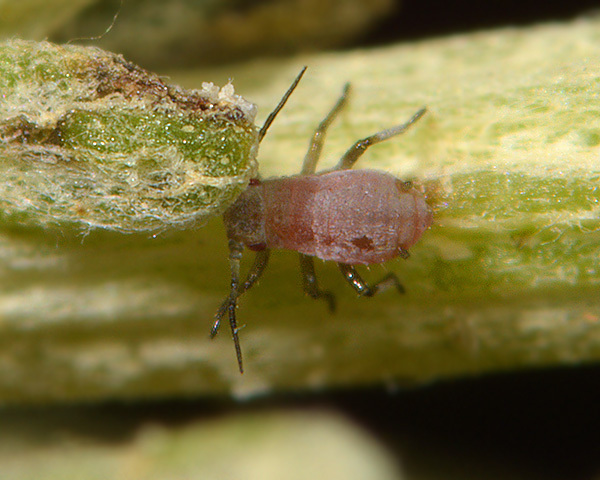 The antennae are pale on the base of the third antennal segment, but they darken distally. The base of the sixth antennal segment is 1.1-1.3 times the length of the fused apical rostral segments (RV+V). The longest hair on the third antennal segment is 0.7-1.0 times the basal diameter of that segment. The fused apical rostral segments are 1.1-1.4 times the second hind tarsal segment. The siphunculi are pale basally, but dark or black on about the distal half. The cauda is dusky. 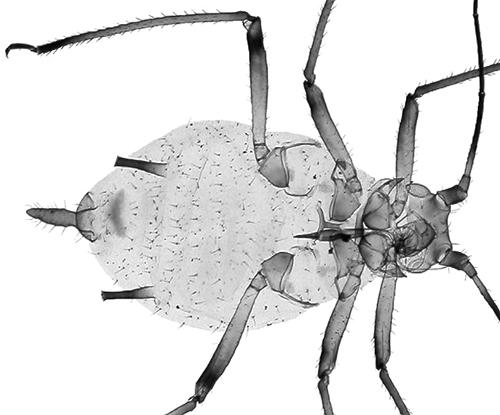 The body length of Macrosiphoniella pulvera apterae is 1.9-2.9 mm. The clarified slide mounts below are of adult viviparous female Macrosiphoniella pulvera : wingless, and winged. 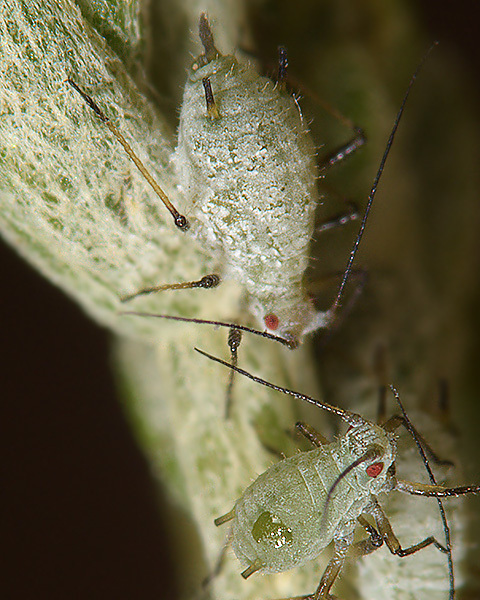 The powdered sea wormwood aphid is largely restricted to sea wormwood (Artemisia maritimum) as its host, although it is occasionally found on other Artemisia species. They appear to mainly feed on the small stems, although some authorities record them as feeding on the leaves. Oviparae and small apterous males are produced in September. Macrosiphoniella pulvera are found on the east and the south coast of England, the west coast of Ireland and much of Europe (excluding Italy, Spain & Portugal) and eastwards into Asia. 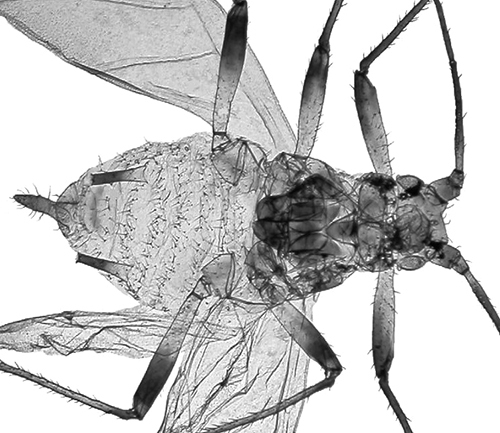 Our observations are the first and only record of Macrosiphoniella pulvera from the English south coast to date. 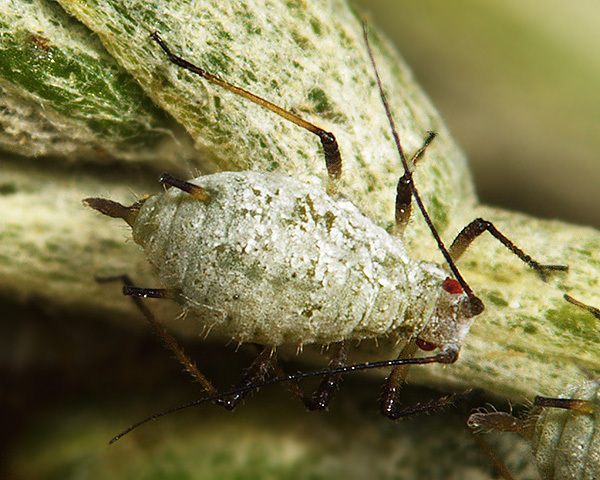 The powdered sea wormwood aphid has excellent cryptic coloration on its host plant, and its presence can be quite difficult to detect even when large populations are present. The white wax powder on Macrosiphoniella pulvera has a similar appearance to the network of minute white hairs on the stem of sea wormwood. This situation is contrary to that shown by several Cinara species (see for example Cinara confinis) where the immatures are cryptically coloured, but the adult has aposematic coloration. Colonies of Macrosiphoniella pulvera in September show colour polymorphism in that small red forms may also be present. This could be a stable coexistence ratio of two colour morphs reflecting differential susceptibility to natural enemies, as shown for Acyrthosiphon pisum by Balog & Schmitz (2013), but given the lateness of the year (September), it seems more likely that these are developing males - possibly with a different strategy for escaping predators (aposematic coloration ?). 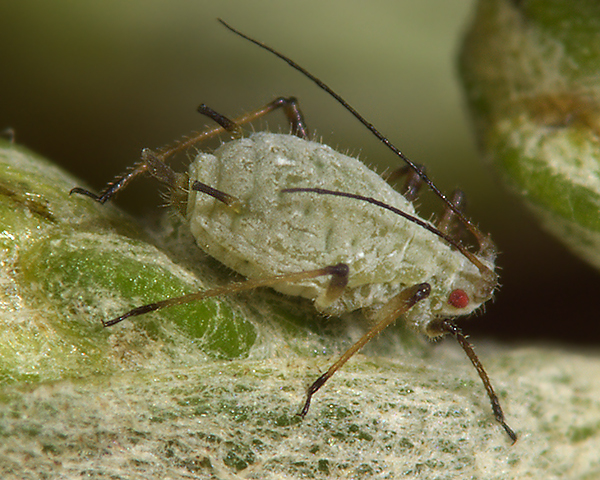 Blackman & Eastop list 14 species of aphid as feeding on sea wormwood (Artemisia maritima =Seriphidium maritimum) worldwide, and provide formal identification keys. 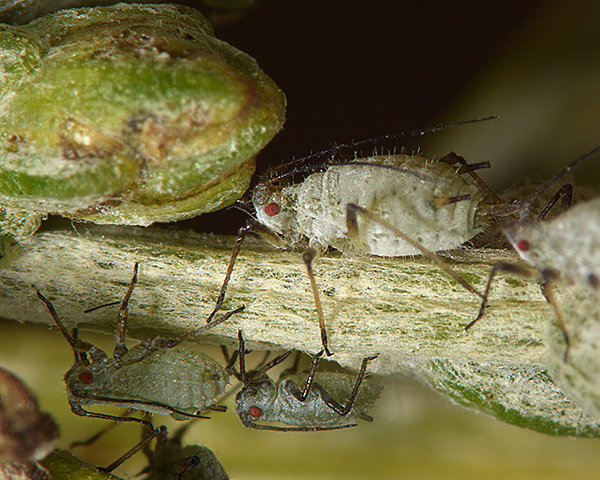 Of those aphid species, Baker (2015) lists 8 as occurring in Britain: Brachycaudus helichrysi, Coloradoa heinzei, Coloradoa submissa, Cryptosiphum artemisiae, Macrosiphoniella abrotani, Macrosiphoniella absinthii, Macrosiphoniella pulvera and Pleotrichophorus glandulosus. We especially than Rye Harbour Nature Reserve for their kind assistance, and permission to sample.